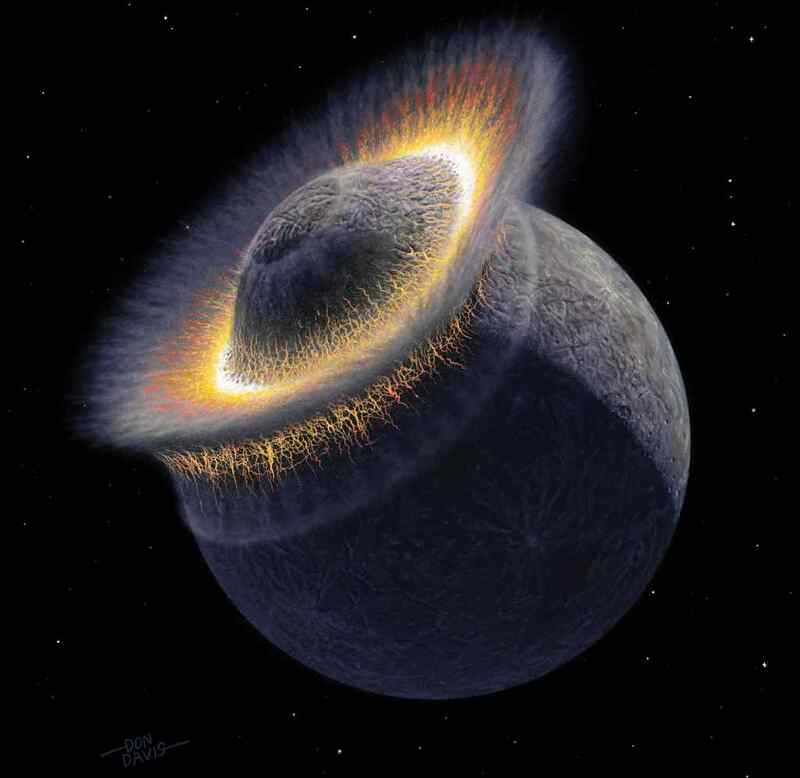 How do planets form? Can they migrate through their solar system? What are they made of? What can modify a planet over time? Is Earth, or our solar system, special? These are all questions that those in our field seek to answer. And there seems, to me at least, to be an easy way of figuring them out: Find More Planets. 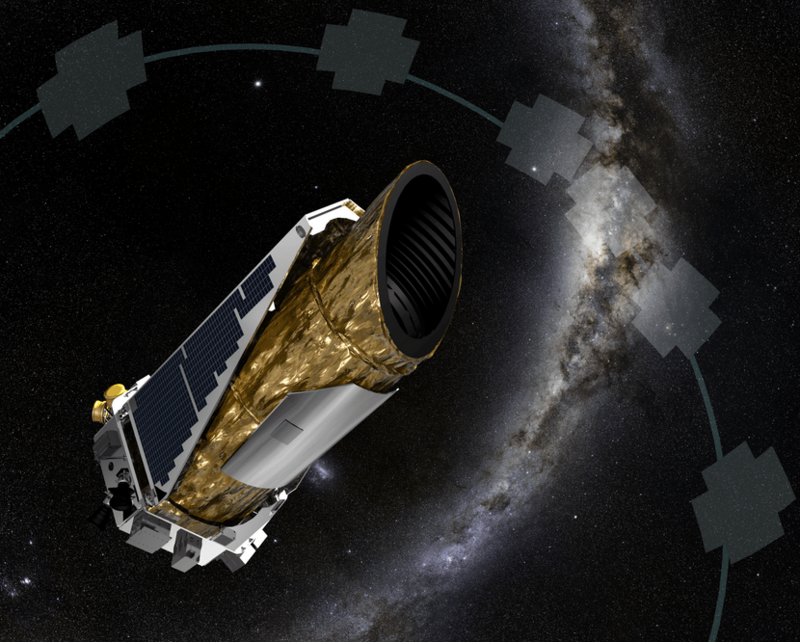 As last week’s news of 1200 new planets showed, the Kepler spacecraft is an excellent way of doing that. 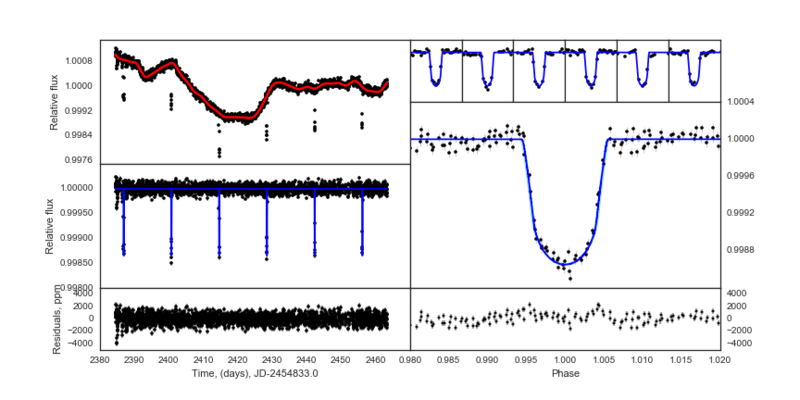 Even in it’s new and slightly more limited mode of “K2”, nearly 200 planet candidates and at least 50 bona fide planets have so far been detected. I am involved in a collaboration between 7 European universities to search for and confirm planets in K2. So far this has resulted in half a dozen papers & planets including the 2-planet K2-19 system. Today I can add one more to that tally: EPIC212521166 b (or 1166 for short). Initially, we searched the 28,000 stars observed by K2 in field 6; scouring the lightcurves with computer programmes and by eye to spot the repeated dips that might be the tiny signals of planets passing in front of their stars. A handful of candidates including 1166* stood out as promising targets, and we took those few stars to the next stage: radial velocities. Using the high-resolution spectrograph HARPS, we searched for the star’s to-and-fro motion that orbiting planets should create. In the case of 1166, we saw a strong signal on the same timescale as we expected from the transits. 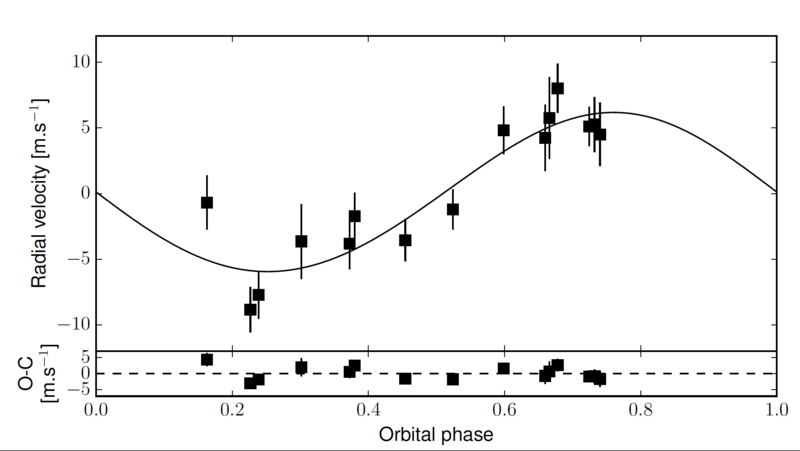 Then, using a code called “PASTIS”, we modelled the radial velocities, the transit lightcurve and information about the star it orbits simultaneously to pin down exactly what 1166 could be. Almost unquestionably, it was a planet, which was a relief. But we can also tell the size of this planet: it has a radius of only 2.6±0.1 times that of Earth, but a mass a whopping 18±3 times our planet. 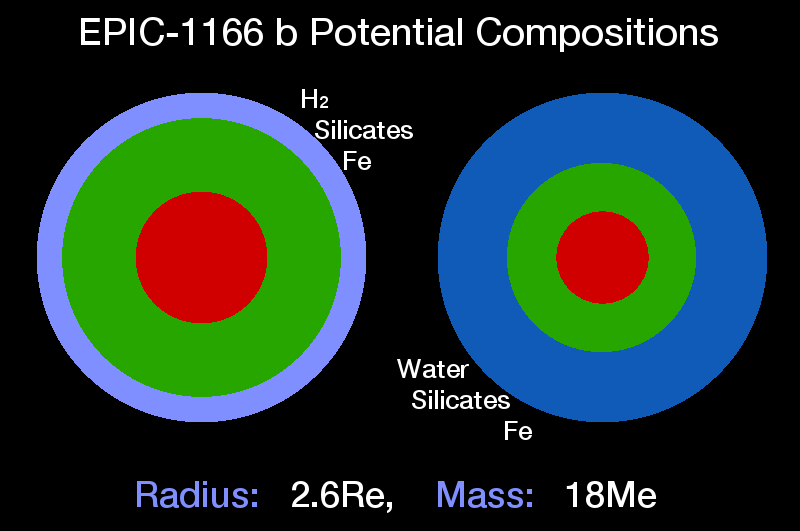 Combined they give EPIC-1166 b a mass similar to Neptune but a radius more than 30% smaller. This makes 1166 b a member of an interesting group of planets: between the size of our solar system’s largest terrestrial planet (Earth) and it’s smallest gas giant (Neptune). So which one of these does our planet most closely resemble? From it’s density (5.7g/cm3), EPIC-1166b might seem to be closer to Earth than the puffy Neptune (1.64g/cm3). However, densities are misleading for objects so large. The high pressures in the interior of an 18 earth-mass (Me) planet are enough to crush rock and iron to much higher densities than their terrestrial values. This effect is so large that, for a 2.6Re planet to have earth-like composition (70% rock, 30% iron), it would need to be around 50 earth masses! That’s a density nearly three times higher than Earth’s, and clear evidence that 1166 b is not quite as Earthlike as first impressions. Instead, it seems like our planet must contain something other than just rock and iron. The most obvious candidate is hydrogen gas. This is so light and fluffy that at atmosphere consisting of only 1% the mass of 1166 b (0.2Me) is enough to cover an 18Me earth-like core in a 0.4Re-deep atmosphere, and produce the mass and radius that we see. Alternatively, water could be another component that could drag the density down. For example, if 1166 b was 50% water and 50% rock, it could also explain the composition perfectly. However, this scenario is unlikely, and a hydrogen-dominated atmosphere seems to be the more likely option. Getting a handle on the interior composition of a planet is interesting, but in EPIC-1166 b’s case it is especially perplexing. Planet formation models show that, once a planet grows to around 10Me, it should begin to rapidly draw in gas from the surrounding gas disc until it becomes a gas giant like Jupiter. In the case of 1166 b, we also have reason to think it likely migrated inwards to its current position through that very gas disc. This is because it is not close enough for tides to affect its position, and orbits in a circular (rather than eccentric) orbit; both pointers to disc migration. So how did it avoid becoming a gas Giant? One way might be if EPIC-1166 b was a gas giant, but lost all its atmosphere due to UV and X-Rays emitted from its star. 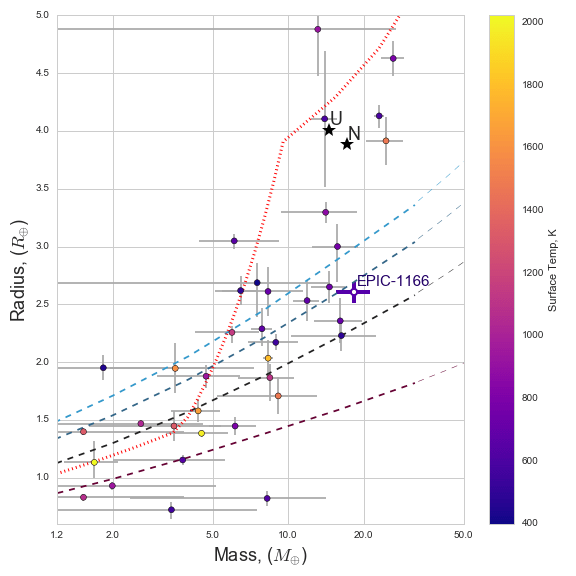 However, at 0.1AU and with a surface temperature of 600K (much less than many exoplanets), 1166 b is too far away to have been affected by activity. My favourite way of solving this puzzle (and it is pure speculation) is through giant impacts between planets. This could both grow a large planet at 0.1AU after the initial planet formation stage, and also blast away a large hydrogen atmosphere. The fact that the star is much older than the Sun (8±3 Gyr) and that we do not see any other planets in the system, further adds to the possibility that this was once a multiplanet system (like K2-19b and c), which destabilised, crashed together, and resulted in a single dense mini-Neptune. The jury is still out on it’s precise formation. But with EPIC-1166 b orbiting a bright star, there is hope that we can re-observe the planet and tie down it’s size, composition and history even further. And, together with the diverse and growing crop of exoplanets, this new mini-Neptune will surely help to answer those important open questions in our field. And if that fails we can always fall back on the exoplanet mantra: Find More Planets. The paper was submitted to A&A and released onto arXiv (http://arxiv.org/abs/1605.04291) on May 13th 2016. *EPIC-1166 b was initially (and independently) detected by Suzanne Aigraine and released on twitter.